This article explores satirical animation films made across the Socialist bloc during 1986-1991. Coming from Latvia or Czechoslovakia, these films are united by their daring subject matters and visual representations, clearly aimed at breaking taboos of the socialist culture and ridiculing the socialist ideology. We screened this little video to introduce our Soviet Horror Movie Night in Riga (August 28). This incredible animation film is based on the legends of the ancient Peruvians, recreated from drawings. The drawings also inspired the psychoactive visuals of the animation, which along with an Aztec lute on the soundtrack, liken it to a psychedelic experience. Põrgu (Hell) is an Estonian animation film by Rein Raamat, Tallinnfilm, 1983. 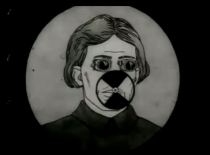 So grotesque and sexual, this animation brings to life three infernally beautiful engravings – “The Preacher“, “Cabaret” and “Hell” – created by the Estonian artist Eduard Viiralt in the early 1930s.